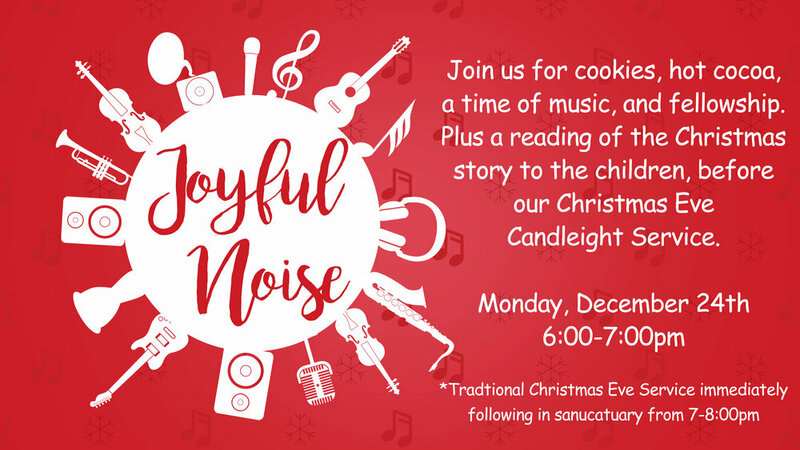 Join us before our candlelight service, for a time of music, refreshments, and fellowship at our Joyful Noise in the fellowship hall. After Joyful Noise join us in the sancuatury for our candlelight Christmas Eve service. Come and experience the fun of christmas with passionate worship, a relevant message, our church fellowship lunch and Christmas caroling with our students and children after lunch. 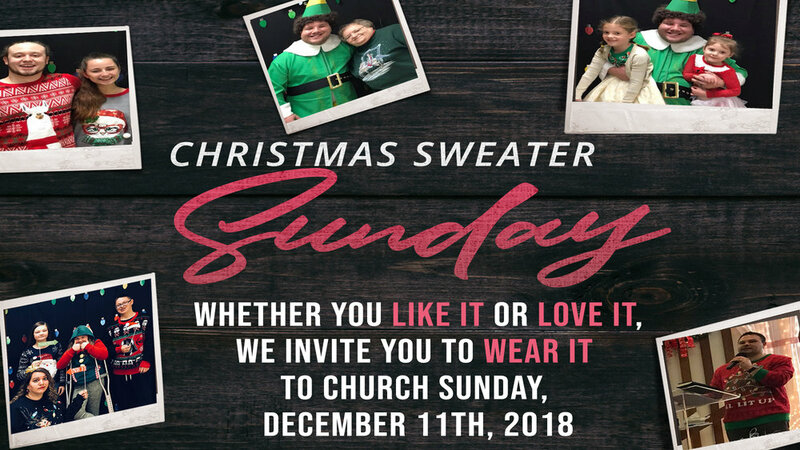 don't forget to come dressed in your ugliset, cutest, inherited or bought christmas sweater, it's a great sunday to invite a friend or check us out for the first time! Come have an amazing time of fellowship and breakfast in the fellowship hall. Followed by special worship with our worship team in the sanctuary and a word from our guest speaker Sherquan Carter. We encourage al ladies from teen girls to college students, moms, friends, grandmas and up to join us for A Sisterhood Christmas. Join us for a blessed time of food & fellowship. Saturday, November 17th at 5:00pm we will be having our Annual TBC Thanksgiving Dinner. Invite your neighbor, family or friends for a blessed time. *This is a FREE event, however we ask that you please sign-up in the foyer, so we can prepare enough food and seats. COME WORSHIP WITH LOCAL WORSHIP LEADERS AT TRINITY BIBLE CHURCH, FRIDAY NOVEMBER 9TH AT 7:00PM! | BRING YOUR FRIENDS! Trunk Or Treat - Family Friendly Fun!! 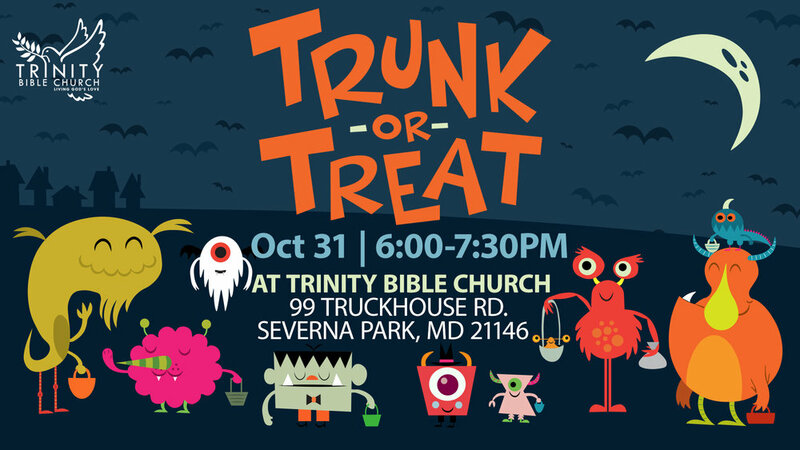 | Cars will be decorated for kids to trunk-or-treat in the parking lot of Trinity Bible Church. This is a FREE event taking place on Halloween Night from 6:00pm until 7:30pm. Invite your friends, family and neighbors! Starting Sunday September 30th for 10 weeks we will be having a church-wide bible study. Join us at TBC from 6:00-8:00pm as we read "The Purpose Driven Church" by Rick Warren. Sign up in the foyer or by contacting the church. Join us September 20-23rd for our Men's Retreat. Trinity Bible Church is celebrating 50 years. We'd like for you to join us for a BIG celebration of all the things God has done through 50 years at TBC, CLICK HERE to see a list of events taking place to celebrate this anniversary, along with a RSVP form. We look forward to seeing you! 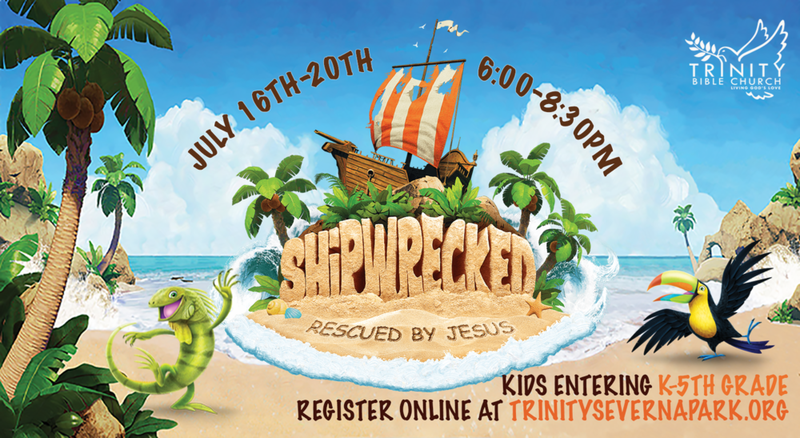 THEME: "SHIPWRECKED" - VENTURE ONTO AN UNCHARTED ISLAND WHERE KIDS SURVIVE AND THRIVE. ANCHOR KIDS IN THE TRUTH THAT JESUS CARRIES THEM THROUGH LIFE'S STORMS. Cost is $20.00 - Seating Lower Level -$ is due Sunday, June 3rd. Join us for a blessed time of food & fellowship. Saturday, November 18th at 5:00pm we will be having our Annual TBC Thanksgiving Dinner. Invite your neighbor, family or friends for a blessed time. *This is a FREE event, however we asked that you please sign-up (HERE or at the info table at church) so we can prepare enough food and seats. *If you would like to help with any part of the event, such as setup/tear down or bringing a dish to share, please indicate. October Sermon Series "FEAR FACTOR"